Nicosia which is Lefkosa (aka Lefkosia) in Turkish is the capital town of Cyprus. The historic town with remnants of the Lusignan's and more, is the only divided city in Europe and in fact in the world. Northern part of this city is home to Turkish Cypriots, while the southern border is home to Greek Cypriots. You can cross between the two, as locals do regularly to see local attractions or even their daily shopping. The southern part is a more commercialised area where you will find familiar franchises such as Starbucks and McDonalds, while the northern part is more authentic with more entrepreneurial local businesses in the forefront. Nicosia is a place you can get to the root of the island and see the contrasts of both sides of Cyprus. The Capital of North Cyprus has its own charm and with contrasts of modernity and history combined. Must see attractions include the old Ottoman in Inn known as "Buyuk Han" which was built in 1572 by the Ottoman governor of Cyprus. 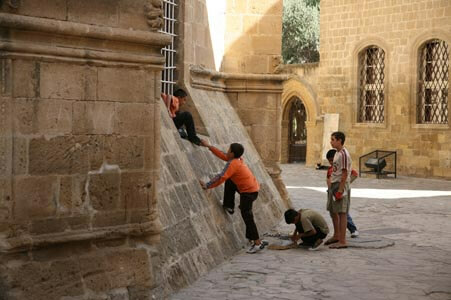 There is also Dervish Pasa Mansion, St Catherine Cathedral, and the old Nicosia castle gate area known as Girne Kapisi. In fact the gothic city is a perfect way to spend a day and evening in the many restaurants. Nicosia is a historic place that allows for a perfect place in taking in the local charms and history of North Cyprus and Cyprus as a whole. Looking for a holiday to Nicosia in Cyprus? Book a cheap holidays to Nicosia North Cyprus with Direct Traveller.